Sue Thomas Marsh entered into the arms of her Lord and Savior on November 25, 2018. She was born in Ada, Oklahoma to Tom and Myrtle Thomas. She was raised there by her parents and doted on by two loving older brothers, Tom Jr. and Jimmie, whom she always looked up to and of which she was very proud. Sue attended Ada High School and spent her freshman year at Oklahoma State before she transferred to the University of Oklahoma where she graduated with a degree in Sociology. While at OU Sue was an active member of Gamma Phi Beta. Soon after graduation Sue married Paul Arthur Marsh, Jr. and they made a home in Muskogee before moving to Norman in 1963 and raising their children there. Sue kept a welcoming home that was an extension of her own grace, beauty, and charm. Sue and Paul’s home hosted numerous teenage pool parties and Young Life meetings. In later years, Sue loved to entertain her granddaughters with a player piano and a closet full of costumes collected from estate sales and the Mummers Theatre. 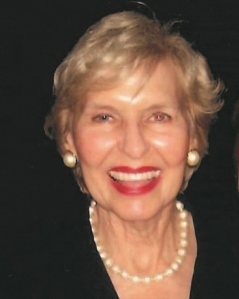 Sue was very active in the Norman community as a member of PEO, a founding member of the Norman Junior League, a board member of Food and Shelter for Friends and Young Life, to name just a few. In her later years Sue quenched her thirst for education by attending numerous courses through OU’s lifelong learning programs. She loved animals of all sorts and provided a home for numerous strays that made their way to her door, either on their own or with an “assist” from a neighbor or her children. Sue was predeceased by her husband Paul and her brothers Tom and Jimmie. She is survived by her children Art Marsh (Jaren) and Matt Marsh of Norman and her daughter Leslie Tucker (Craig) of Oklahoma City as well as her grandchildren, Jennifer Dugan (Eric), Jacey Barton (Cody), Claire Elmgreen (Mike), Kathleen Krenger (John) and Annie Tucker. Sue’s survivors also include 3 wonderful great grandchildren, Max and Henry Dugan and Elle Krenger. Services will be held at 10:00 Wednesday, November 28th at Havenbrook Funeral Home in Norman. The family is forever grateful for the love and care she received from the staff at both Arbor House and Tender Care Hospice. Memorials can be made to Food and Shelter for Friends or the Oklahoma Chapter of the Alzheimer’s Association.